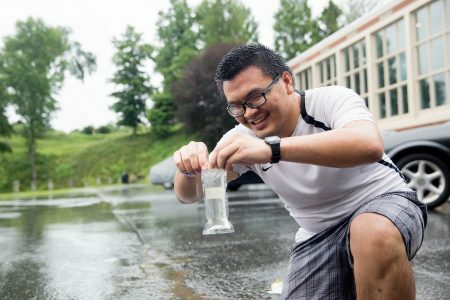 While most people hope for sunshine and clear skies in their summer forecast, Margaret Van Beek ’19 and Thinh “Bill” Pham ’20 are holding out for some more cloudy, rainy days. After all, rainwater is essential for their Summer Research project. “I have seen the weather app a lot this summer,” Van Beek said. The pair has partnered with Sarah Sojka, a physics and environmental studies professor, to test and compare the quality of rainwater runoff from various sources around campus that could be used for rainwater harvesting. Rainwater harvesting is a technique of collection and storage of rainwater into natural reservoirs or tanks, or the filtration of surface water into subsurface aquifers. Sojka formerly worked for a rainwater harvesting company, and said that while it is widely believed that roof runoff is cleaner than ground and surface level runoff, there has been little research done to support the claim. Bill Pham ’20 and Margaret Van Beek ’19 test water samples in the environmental science lab. On rainy days, the group is gathering rainwater samples from the roof of the Student Center and the front lawn of Leggett Building as well as parking lots and sidewalks around campus. By the end of the Summer Research program, they hope to have three to five samples that they can test for PH, bacteria like e coli, and other contaminants. They are also compiling statistics from other sources into charts and graphs that show the differences between the various runoff sources. Both students are interested in environmental science and the concept of rainwater harvesting.